The hemoglobin A1c test measures the HbA1c blood level. The hemoglobin A1c lab test measures the hemoglobin A1c blood level. Why is a hemoglobin A1c test important? The hemoglobin A1c blood test estimates the average blood glucose over the past 120 days and is used to screen for diabetes and track progress in diabetics. This Hemoglobin A1c Test is a blood test. It typically takes 2 business days or less. The hemoglobin A1c test measures the hemoglobin A1c blood level. The hemoglobin A1c test is also known as an HbA1c test, hemoglobin A1c blood test, glycated hemoglobin test, glycated glycohemoglobin, or, simply, an A1c test. Hemoglobin A1c was first identified in the late 1950s and became more actively used in clinical decision-making towards the late 1970s. The hemoglobin A1c helps assess how well blood glucose is regulated in the body. This lab test depends on hemoglobin, a protein found in red blood cells that is typically known for its role in transporting oxygen around the body. In addition to this function, hemoglobin also has an affinity for glucose (also known as blood sugar) found in the blood on a part of the hemoglobin known as the beta chain. The HbA1c blood test measures the percentage of hemoglobin in the blood that has glucose bound to it. In a healthy person without diabetes, around 3-5% of the hemoglobin in the blood will have glucose attached to it. The situation changes when elevated levels of glucose exist in the blood. When the blood glucose is high, it will engage more hemoglobin beta chains and the percentage of glycated hemoglobin molecules (i.e. hemoglobin with glucose attached) will increase. A higher concentration of glycated hemoglobin molecules is reflected in a higher measurable hemoglobin A1c level. In people with diabetes and chronically elevated blood sugar levels, the A1c blood level will typically be higher than the average person. In contrast to the glucose test, the hemoglobin A1c lab test measures the average blood sugar level over approximately the past three months (slight variations from person to person) as opposed to at a single point in time. The reason for this is that red blood cells live for around three months and, as red blood cells are made and destroyed, the glycated hemoglobin molecules count is continually refreshed. Because the A1c level test assesses average blood glucose over a longer period of time, there is typically less variability in the reported A1c lab result if one were to take repeated measurements over a short period time (e.g. one week) compared to what one would see on sequential blood sugar measurements. Some studies suggest that A1c blood levels will start to change approximately three weeks after intensive regimens designed to lower blood glucose are initiated. Because the HbA1c lab test is a very common test, the process for getting the hemoglobin A1c test near you is generally a simple one. Almost every lab location offers this blood test and, after getting your blood drawn, the lab results are usually available fairly quickly. Once the A1c test results are ready, interpreting the actual A1c lab report is not too difficult. As one can see on the A1c sample report we have provided above, the results (6.6% in this case) can be compared to the reference range provided by the laboratory. On this A1c lab report, a level <5.7% is consistent with the absence of diabetes while >or= 6.5% (as is the case with this report) is consistent with diabetes. Levels between 5.7% and 6.4% are considered to be consistent with an increased risk of diabetes known as prediabetes (but not actual diabetes). Because prediabetes does not always evolve to diabetes if someone makes various lifestyle changes, identifying that one is prediabetic through this blood test is of immense value to anyone who wants to avoid becoming diabetic. Because of the important information that the HbA1c test conveys, it is typically considered an important part of routine lab testing and particularly so when there is a concern for diabetes or elevated blood sugar levels. As a screening test, the hemoglobin A1c test can help paint a larger picture when utilized with other lab markers which is why it is included in the diabetes screening panel and diabetes management panel. For known diabetics looking to optimize their lab markers, tracking A1c levels in conjunction with other blood and urine tests can identify areas of improvement that might reduce potential complications of diabetes such as cardiovascular disease and complications related to the eyes and the kidneys. There are some limitations to the HbA1c test. Because this lab test is dependent on one having normal hemoglobin that can bind blood glucose, any abnormalities with that process from other conditions can lead to a less accurate result. For example, people who have hemoglobin molecule variations (e.g. sickle cell disease or another hemoglobinopathy) or specific types of anemia with lower hemoglobin levels might not benefit from this test. Also, one can get an HbA1c test too early if looking for changes related to intensive lifestyle changes given the delayed way in which the test measures average blood glucose levels. Another limitation of the hemoglobin A1c test is that it measures the average blood glucose levels but not the day-to-day variation of the blood sugar level. Known as glycemic variability, one might have a normal blood glucose level on average but have periods during the day when the sugar levels are very high and other periods when they are low, leading to a normal average. Although significant glycemic variability occurs infrequently, people who are interested in knowing how much glucose level volatility exists on a daily basis should consider getting a GlycoMark test. Glycated hemoglobin molecules are not typically thought of as targets for new therapies. Instead, in clinical medicine, the primary use of the hemoglobin A1c lab result is for the diagnostic information the result conveys. It is notable that glycated hemoglobin is thought to thicken the blood abnormally and increase damage to the linings of blood vessels (leading to plaque formation) which makes reducing levels paramount in people who have them. From a therapeutic standpoint, other measurable molecules like insulin and adiponectin are more actively involved in regulating blood sugar levels which makes them more interesting as potential targets for managing hypoglycemia (low blood sugar) and hyperglycemic conditions like diabetes. This is why some might get the hemoglobin A1c lab test with the insulin test or the adiponectin test. Despite any limitations, the hemoglobin A1c test remains an excellent choice for evaluating average blood sugar levels and screening for diabetes, particularly as part of any larger wellness testing or screening program. 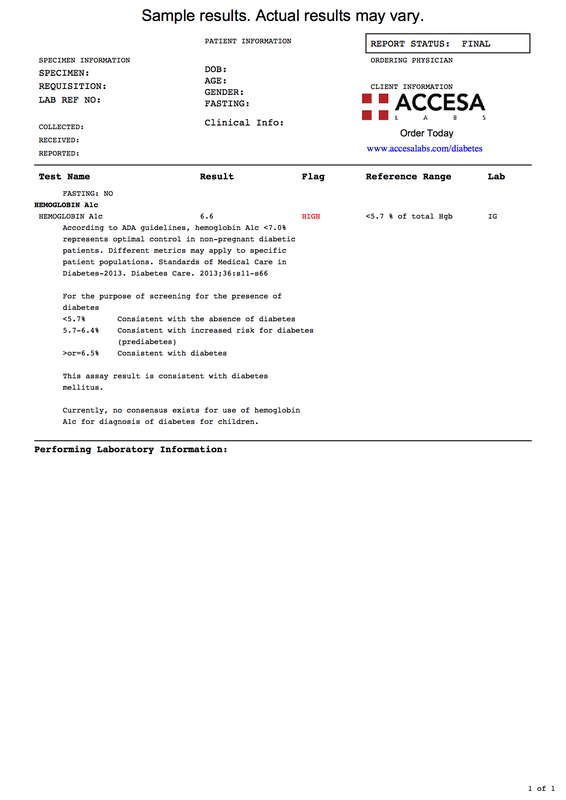 We hope you found this HbA1c lab test report video helpful. Hemoglobin A1c Test at Guaranteed Prices.